John Will will be returning for a quick workshop at MKG Seattle on Monday night June 23, 2014. ALL martial arts classes are cancelled that evening. (MAX10 and CrossFit are NOT affected) Don’t miss a chance to train with one of the worlds elite teachers. 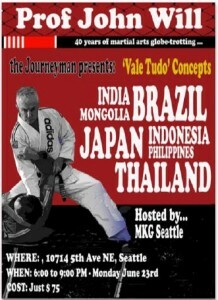 This is NOT going to be a BJJ seminar but will cover some ground work. John will be doing a street defense/MMA hybrid seminar. Basically standing to ground for a self defense and sport paradigm. Please use our Facebook event page HERE to hold your space.